Amazon has given the Kindle app a major overhaul. As well as a fresh lick of paint, the new Kindle app improves the user experience and integrates Goodreads. This is Amazon displaying its love for reading, with the company ultimately hoping it will inspire you to buy more books. We suspect most of our book-loving readers now own Kindles. Perhaps you have even splashed out on the new Kindle Oasis with waterproofing The All-New Kindle Oasis: 9 Things You Need to Know The All-New Kindle Oasis: 9 Things You Need to Know If you're in the market for a new Kindle, here are nine things you need to know about the all-new Kindle Oasis. And yes, before you ask, it's still expensive. Read More . However, a Kindle isn’t the only way of reading Kindle books. The Kindle app turns other devices into books, and Amazon has now made it better than ever. Kids Still Read Books, Right?! The new Kindle app has been improved in a myriad of ways, starting with the logo. 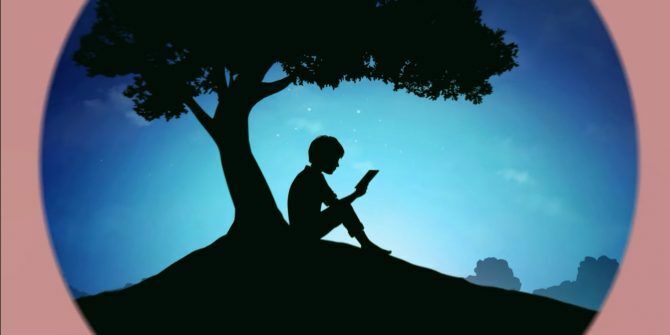 The old Kindle logo is out, replaced with the evocative image of the kid sitting under the tree reading. This is a small change, but one which reflects Amazon’s growing interest in fostering brand awareness. Visually, the app is now lighter than before, with a new white background mimicking the aging of old paper. The book covers are larger, and the fonts have been altered to make everything clearer. All in all the visual changes make the new Kindle app nicer to look at for long periods of time. Goodreads, which Amazon acquired in 2013, is now deeply integrated into the app, boasting its own tab which brings features from the standalone Goodreads app into the Kindle app. Goodreads users will get much more out of this integration, but even non-users will see content provided by influencers. Most Goodreads features are debuting on iOS, but will be added to Android soon. There are also some UI changes. Your current book will now follow you around the app to enable you to get back to reading more quickly. And the search bar is now front and center, with Amazon using it to recommend new books for you to buy. Which is the whole reason this app even exists, obviously. You can download the new Kindle app on PC and Mac, on Android, and on iOS using the links. These changes massively improve the Kindle app, making it both look better and easier to use. It’s clear Amazon has put some time and effort in here, knowing that it could be rewarded with extra book sales. But if you regularly read ebooks just give in to temptation and buy yourself a Kindle 7 Ways to Take Full Advantage of Your Kindle 7 Ways to Take Full Advantage of Your Kindle Millions of people now own Kindles, but most of them aren't taking full advantage of these magnificent devices. There are various ways to take full advantage of your Kindle, and here are just seven... Read More . Do you use the Kindle app on your smartphone, tablet, PC, or Mac? Is this in addition to, or instead of, owning a Kindle? If you don’t yet own a Kindle, what’s stopping you from buying one? What do you think of the new Kindle app? Please let us know in the comments below! The GoodReads integration is a good thing. But have they removed the "carousel" cover-flow interface? That wouldn't be good.